For 2019, we, Peter Sommer Travels, have reformated our brochure. It was printed a week ago and is now being posted to our subscribers on six continents. If you are one of them, you should expect it in your mailbox in the next two weeks. If you are in a rush (and you might be, because our cruises and tours are are selling better than ever), you can download it from our website or browse it there. If you are interested in joining one of our scheduled tours or cruises, the brochure is a key source of information, as is our website. Should you be looking for a custom-made tour on land or sea, please scroll towards the bottom of this post. The brochure really speaks for itself (that’s what it’s for), but this blog post allows us to give a handy synopsis of our 2019 tours and cruises. If you are a long-standing Peter Sommer Travels aficionado (and we appreciate you enormously! ), it will offer a little extra insight into what we are up to, and if you are new to us, it might give you an impression of what this small and highly-specialised British tour operator does and plans to do, and what we might have to offer you. Our AITO Gold Award for 2017. After winning AITO’s (the UK Association of Independent Tour Operators) first ever Tour Operator of the Year Gold Award for 2015, we had followed with Silver for 2016. The AITO awards are based on independent traveller reviews, so we are very proud of those results. We are even prouder to have received Gold again for 2017. You can read the independent reviews here. We certainly enjoy those laurels, but we have no intention to sit on them: the work continues. The length of our active season has been steadily growing and 2018 was par for the course, with a first tour (Exploring Sicily) in early April and a last (Exploring Rome) in November. This year also saw a record-breaking private tour, a family experience mixing sea and land, covering about three weeks in Athens, the Dodecanese and the Peloponnese. One of our gulets, the Sunworld IX, off Nisyros this summer. The biggest change we have made in 2018, however, is putting our tours for the following year on the website much sooner when we used to. It was obvious that we should do so, and the results are very clear: we currently have more bookings for the coming year than we ever had at this time. This means that the brochure, which can only be produced once all (or nearly all) tours are finalised, cannot now be our primary means of disseminating information on our future offers, and effectively it has not been so for some time: if you are interested in our tours and cruises, your first stop should be the website and for most of our guests it is so. Nevertheless, the brochure is still a fine hands-on expression of what we do and those of you who prefer using it will be able to do so online or in print. As always, we take a brief and quiet breath at this time of year, to look back at how the last season went and to look ahead at what we intend to do next year. Some new tours are in preparation, some older ones are being revived and reformulated, and all existing ones are being considered carefully to see how they can be improved. This is what we do every winter: our ambition is simply to run the best-prepared tours available wherever we take our guests, and what that means is constant maintenance. Restaurants change chefs or menus, sites and museums close for renovation, open newly or offer special exhibits, hotels expand or new ones become available, infrastructure changes – we stay on top of all that to make any such modifications feed into offering the best experience possible. Now is the time to do all that. If you want an up-to-date insight into what we are working on, look at our Facebook page now and then: that’s where we put up news and thoughts and impressions on a daily basis. Also, drop in here, on our blog, as you are doing now: it’s not a news site, but it’s where we share a lot of what we are thinking about. Our 2019 plans are expanding on what we’ve done during the last two years, but in a careful way: we’re a small company and we are eager to grow, but only while maintaining the quality and the character of our offerings. In 2017, we opened up three new countries at once, and in 2018, we oversaw a major expansion in the number of scheduled tours we offer. Compared to 2018, we are being prudent next year, offering 47 scheduled tours on 30 different itineraries in six countries (as opposed to 39 tours on 27 different itineraries this year). It’s a record for sure and if you look only three years back, at 2016, we then offered 27 tours on 20 itineraries in three countries. On scheduled tours, we’re up 20 per cent since last year and up 74 per cent since 2016, and on different itineraries, we’re offering 11 per cent more than last year and 50 per more than three years ago! These numbers are as of now, there is always a chance we might add another few trips as the year runs! Diocletian’s palace at Split, a Roman monument that has no match. The Renaissance Town of Korčula on the island of the same name: a place where you can drop into long-gone ages. Our guests love Croatia’s Dalmatian shore and we’re pleased, but not surprised: the region is a wonderland of peninsulas, islands and bays, full of deep cultural content straddling the histories of central, southern and eastern Europe. For the time being, all our Croatian offerings are cruises, covering the whole range of cruise types: cultural/archaeological, walking/hiking and gastronomic. The 2019 season brings eleven trips on five itineraries. 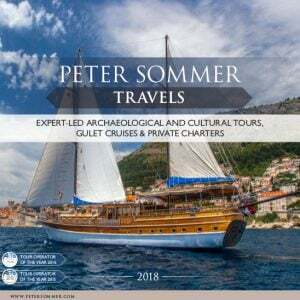 Our oldest Croatian cruise, Cruising the Dalmatian Coast: from Split to Dubrovnik (or vice versa from Dubrovnik to Split) is now a classic Peter Sommer Travels itinerary. It is a great way to explore a region of great, but often unfamiliar, historic interest and astonishing beauty, combining great and famous highlights with off-the-beaten track delights, and it is running four times, in May/June and August/September. Its northern Dalmatian equivalent, Cruising the Dalmatian Coast: from Šibenik to Zadar, newly introduced last year, has also proved very popular. It offers a more original take on the region with a great range of cultural insights and superb maritime landscapes. In 2019, it will run three times, in June and September. The great wall of Ston, cutting off an entirely peninsula, is a unique medieval monument and it’s best explored by walking its length. Likewise, Walking and Cruising Southern Dalmatia will be in its third year, with various modifications to make it an even better, more beautiful and more diverse experience. In 2019, we scheduled it thrice: for May (to take advantage of the lovely spring vegetation), September and September/October. .
Our newest Croatian itinerary is A Gastronomic Cruise of Dalmatia, approaching a region that sits on various culture-historical fault-lines through its cuisine, a most remarkable mix of elements from several European traditions and the all-important Ottoman one. Croatian cuisine is quite accomplished and based on great ingredients, but by no means pretentious, and it offers a great introduction to the deep food-historical background of the Balkans and especially to the often overlooked culinary tradition of the Adriatic Sea. What fun! It runs in September/October. The Portara of Naxos in the Cyclades, a monument that combines lasting mystery with great architectural achievement and breathtaking beauty – a great example of what we show you in the Cyclades. Greece is a core of Western culture and a focus of cultural travel. Ten years ago, when we first offered an itinerary in Greece, we spent a total of a week with our guests in that historic country. In 2019, it will be nearly twenty weeks, both sea and land. Greece, mainland and islands, is now a central focus of Peter Sommer Travels’ offerings, a highly competitive market where we are striving to offer the best-prepared and most informative tours available. Our 2019 offerings comprise thirteen tours on eight different itineraries. Our classic two-week Cruising to the Cyclades now runs twice per year (in May/June and in September), and in 2018, we also ran it as a private charter for the first time. It is a tour like none other. combining amazing highlights like Santorini, Paros, Naxos, Delos and Kos with off-the-beaten-track gems like Kalymnos or Nisyros. Our other tour-de-force cruise in Greece is the two-week Cruising the Dodecanese, based on the same principles, but located in the islands closer to the Anatolian shore. It is every bit as spectacular as the the Cyclades, offering insights on Archaic and Classical Greece, the Roman and Byzantine eras, but also the Ottoman and Italian past of the archipelago, and the exceptional presence of the Knights of Saint John (or Knights of Rhodes) in the same waters and islands. It runs in September/October. Mandraki on Nisyros in the Dodecanese, a traditional Greek Island town on an island that has very much to offer. Our one-week trip in the Dodecanese, Cruising the Aegean: From Kos to Patmos, has rapidly become one of our most popular itineraries. First launched in 2017, it became a standard by this past season and we’re happy with that: it is a joyous cruise that allows us to bring out the most attractive aspects and the most fascinating stories of a group of islands we know very well, places where we have friends waiting for us and our guests. It runs three times in 2019, in May June and August/September, and additionally as a Family Adventure in July/August. For the second time, we will also offer our Walking and Cruising the Dodecanese, set in the same area, permitting a more intense approach to the islands’ landscapes and access to a different set of historic sites. It takes place in September/October. Greece is not all islands and many of its greatest treasures, most evocative sites and most beautiful landscapes are not ideally approached by boat. Partly in response to this issue, how to share this wonderful range of experiences with our guests, we have developed our system of ‘Exploring Tours‘, designated regional itineraries, designed to be the best-prepared and best-guided tours available and to take in as many aspects of an area as possible, from cultural and archaeological sites via authentic local cuisine to carefully selected accommodation. The Lion Gate at Mycenae in the Peloponnese has been standing for 3,300 years. From the Bronze Age via Homer to Classical tragedy, it evokes an entire world of stories. Crete is one of the most famous Greek islands, but in many ways feels like a country by itself. Its superlative diversity of landscapes, its living traditions and its exceptional wealth in archaeological and historical monuments from the last five millennia or more combine into a vast range of possibilities, and our Exploring Crete is a careful selection of the best, most informative, most beautiful along them. The tour, just under two weeks long, is available three times in 2019, in April, May and October. It is your chance to discover the many golden ages of the island: the Minoan Bronze Age in the second millennium BC, the Archaic era of state formation in the ninth to sixth centuries BC and the flourish of Byzantine art in Venetian-held Crete during the thirteenth and fourteenth centuries. Equally diverse and equally fascinating is the Peloponnese, the great peninsula that marks the southernmost extension of the Greek Mainland. It is a well-established travel region, but nothing on the market is quite like our two-week Exploring the Peloponnese, a tour that is jam-packed with stunning sites covering the rich heritage of the area: Mycenae, Olympia, Corinth, Mystras, Monemvasia and so many more. Ceiling frescoes in the Post-Byzantine ‘Omorfiklisia’, or ‘beautiful church’ on Aegina, near Athens. Easter in Athens, set during the Orthodox Holy Week in Late April, is an unusual tour, a unique opportunity to experience a great city, its glorious past and vibrant present, during the greatest of its annual festivals. 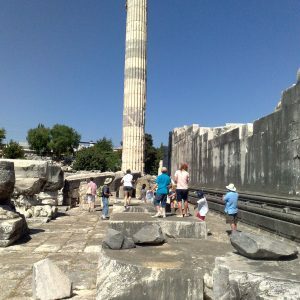 Besides the stunning monuments of the Classical era, crowned by the Acropolis itself, the tour also incorporates key events of Easter tradition, such as the Good Friday processions and the events of Easter night, when sombre mourning is driven out by a flood of light and celebration. Furthermore, it opens up new hands-on ways to engage with Athens and its life across the ages, such as a private cooking class allowing our guests to participate in producing and consuming a festive meal, and a visit to a potter’s workshop specialised in recreating the superb products of ceramic art in Ancient Greece, again offering the chance to participate in creating beauty. Knidos in Caria, just one of the countless ancient cities in Turkey. Ah, Turkey! There would be no Peter Sommer Travels without that great country with its unique history linking Europe and Asia. Turkey’s archaeology is what gave our founder, Peter Sommer, the idea of organising high-quality expert-led tours, and for a long time, it was the only country we covered. While that is in the distant past, we are still as eager to offer experiences of Turkey’s astonishing cultural heritage and equally astonishing contemporary hospitality as we were then. We have increased the range of our Turkish offerings this year and we are eager to continue doing so, reviving and refreshing some of Peter Sommer Travels’ formative itineraries. In 2019, we offer ten tours and cruises on eight itineraries. The Library of Celsus in Ephesus: emblem of Roman glory. Pride of place belongs to Peter’s very own signature tour and our only land tour in Turkey for 2019. In the Footsteps of Alexander the Great: the Conquest of Asia Minor (Part 1) is a version of an epic trip through Asia Minor that Peter first ran in the 1990s and that has since then been modified and perfected to offer a uniquely breathtaking introduction both to the archaeology of Western Anatolia and to the career of Alexander the Great, a historic giant. There has been a hiatus for various reasons and we are thrilled to be able to offer this itinerary in new glory, running in April/May. . The ancient fortress of Loryma in Caria, built by the city-state of Rhodes, is one of the best-preserved of all Ancient Greek fortifications. Cruising the Carian Coast is an old favourite, combining a superbly unspoilt shoreline with a remarkably diverse selection of ancient sites highlighting ancient Anatolian, Greek, Roman and Byzantine culture, including jaw-dropping sites like Knidos and Kaunos. In 2019, we run it once each in June and September. Our oldest Gastronomic Cruise also follows that same Carian coastline. Led by an archaeologist, food lover and connoisseur of the region, it offers an unparalleled way to enjoy Caria. There is nothing else like it on the market and we are proud to have been running it every year since 2011. Next year’s iteration is in June. Lycia is a region that combines fine examples of Greek and Roman cultural and architectural achievements with a tantalisingly mysterious and local character, a place where we can see different influences mixing and merging during antiquity. We offer a whole series of tours there. Royal tombs at Xanthos, the occasional capital of ancient Lycia. Cruising the Lycian Shore is a two-week tour, exploring the region’s riches in detail. It is an in-depth exploration of a unique coastline, both in terms of landscape and cultural heritage. We are offering it in August/September of 2019. We will also run two walking cruises along the same shores: the two-week Walking and Cruising the Lycian Shore in September/October and the one-week Walking and Cruising Western Lycia in May. Both of them combine the fascination of the area’s ancient remains, including sites that can only be reached on foot, with its wonderfully unspoilt coastal and mountain scenery. Approaching them by walking is an opportunity to grasp the region’s character in a superbly intimate way. The so-called “Temple of Concordia” at Agrigento, ancient Akragas, not only one of the best-preserved Greek temples to survive, but a leading influence on the modern view of antiquity. It’s not a secret that Italy has a denser and richer collection of important historical monuments than virtually any other country in the world. There is an endless list of superb and beautiful places to explore, and many ways to do so. Our profound experience of the country, our careful preparation and our superb tour experts make Peter Sommer Travels’ tours and cruises a most distinguished way to discover Italy and its cultural heritage. In 2019, we are offering nine tours on five itineraries in Italy. Our two-week Exploring Sicily belongs to the ‘Exploring’ land tours. It provides a panoramic insight into Italy’s (and the Mediterranean’s) largest island and its history, unparalleled in its diversity. Great Greek cities and their temples, Phoenician strongholds, medieval cathedrals and Baroque towns combine with the living culture of this very special place and its people to make for an unmissable tour. In 2019, we offer it twice, in April and May/June. Our second, shorter tour on the island is the exceptional Gastronomic Tour of Sicily, a profound exploration of a different kind, approaching the island’s extraordinary history through its cuisine, which reflects the many influences that have affected Sicily over the centuries. The profound knowledge and experience of our guides makes the tour a once-in-a-lifetime experience. We are running it twice, in April and September. Extraordinary Roman wall paintings at the Villa Oplontis on the Amalfi Coast. Our final Italian land tour (for now) is Exploring Rome. Rome, the “eternal city” is a place like none other, a prime theatre of world history and an open-air museum in its totality, covering every major period of the last two millennia. For 2019, we have reworked the tour, now slightly under a week in length, to be a superb introduction to all aspects of Roman history, presented by an exceptional guide. It is available in April and October. If you want to see more of Rome, also consider our add-ons. We currently have two week-long cruise itineraries in Italy. The first, our original Italian tour, is Cruising the Amalfi Coast, running twice in August/September. Using one of our finest gulets and limited to a small group, it is a truly high-end offering, an opportunity to discover or rediscover one of the most celebrated cultural heartlands of Europe, from its Greek settlers via the volcanic destruction and preservation of Pompeii and the glories of medieval and later architecture to the fascinating city of Naples. Doing so by gulet is a delightful way of approaching the area in all its beauty. A view from the Aeolian Island of Vulcano. Our newest cruise in Italy is Cruising the Aeolian Islands, now entering its third year. In 2019, it runs in June. The Aeolian Islands, a volcanic archipelago located between Sicily and the mainland, are not yet a household name in international travel, but they certainly deserve to be so. Our leisurely cruise offers a perfect combination of superb maritime landscapes, cultural discovery and the differing island lifestyles, ranging from authentic local tradition to the hang-outs of the jet set. The cruise is a wonderful opportunity to see these unusual islands as a group, enjoying what there is on offer on each of them and delighting in the waters between. Stonehenge, perhaps the most iconic of all prehistoric sites in Britain, is part of our Exploring Wessex tour. As the concept of Peter Sommer Travels’ signature ‘Exploring’ tours began to take shape, starting in our Mediterranean destinations half a decade ago, and as we defined their key features in recent years, we realised that the same principles that make these tours the best-prepared itineraries in those regions could also be applied to developing similar tours nearer home. Unstinting attention to all aspects of a region, a desire to present them in a holistic way and tie them together through great narrative, bold “outside the box” thinking and profound knowledge of the area in question permit us to offer a selection of high-quality tours in Britain and Ireland. Thrilled by the initial success of their 2017 launch, we are especially happy about our newest addition to this growing set of itineraries. Enormous: the 13th century Caerphilly Castle. In 2019, we are running three itineraries in Britain, each of them once. Our newest tour is Exploring Wales: Millennia under the Gaze of Mountains, available for the first time next July. Peter Sommer Travels’ home base is Monmouth, located just inside the borders of Wales, so we are truly excited to be able to offer a tour here! Wales, one of the three constituent nations of Mainland Britain, is a region with its own very distinctive character and with a history full of drama. Different Celtic tribes rubbed shoulders here with one another, then with the conquering Romans, later with Vikings, Irish, Normans and of course the English. There are countless traces of this history, set among the green hills and rugged mountains of the Welsh countryside: Roman forts, a vast array of medieval castles, serene monasteries nestling in verdant valleys, and each of these monuments has its own story, ranging from half-remembered myths and legends to the complexities of British history. Our new tour, concentrating on the south and west of Wales, will bring you to the sites, and their stories to you. Milecastle 39 on Hadrian’s Wall. Just beyond the Welsh border from us is a region that fulfils all the romantic images of what England should look like, and that is so intrinsically connected with all aspects of English history that nearly all of it can be traced, and told, there: Wessex. It is the venue of Exploring Wessex, from Neolithic Avebury to Georgian Bath, a truly superlative itinerary, available in June/July 2019. Mysterious Neolithic stone circles, Roman remains, great castles and houses and two of England’s finest cities, medieval Salisbury and Georgian Bath, await you. Further north, we are running Exploring Hadrian’s Wall: Romans, Reivers and Romantics, an increasingly popular tour of which we are very proud, in June 2019. Of course, it uses the formidable monuments, or really series of monuments, that combine to make the great Roman border defence as its main narrative, but that’s not all. Following the Roman story, it also encounters the many other phases of a fascinating region’s long history, many of them set in stunningly beautiful landscapes. The Neolithic Portal Tomb of Poulnabrone in the limestone country of the Burren, County Clare. Kylemore Abbey, a 19th century folly in County Galway. Exploring Ireland: the Heart of the Emerald Isle is scheduled for June. The twelve-day tour concentrates on the central section of Ireland, from the historic centres around Dublin on the island’s eastern shore via the bucolic midlands to the rugged coast of the Atlantic west. Ireland, in spite of its geographic proximity to and long-standing historical connection with the larger neighbour to the east, has managed to maintain its own very distinctive identity and character, its own flavours and atmosphere, all based on its very own history. The tour offers a sweeping panorama across six millennia of this history, from deep prehistory via the Celtic Iron Age to the treasures of Early Christian Ireland and the turbulent history of the last thousand years in a country that mixes deep-rooted tradition with vibrant modernity. Our gulets are also available for private guided charter. Gulets off the historic site of Kale in Lycia, southwest Turkey. There is always more. The same careful preparation, profound knowledge, hands-on approach, attention to detail and passionate love of stories and histories that enable us to offer the scheduled tours listed above also go into our expert-guided private tours and charters, an ever-growing aspect of our activities. How does it work? 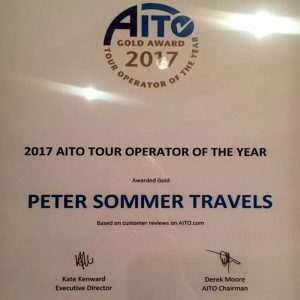 If you fancy sharing the Peter Sommer Travel experience, on land or sea, with a group of friends or family, you can contact us, indicating what region amongst those we offer might interest you, how many people your group consists of and when you are interested in travelling. Of course, we are also very eager to learn what your specific interests might be: archaeology or wine, architecture or hiking, a tour for seasoned travellers, or one for children, and so on. We then look at the options and make suggestions, beginning a process of mutual discussion to design the cruise or land tour that perfectly suits you and those you intend to travel with. A view from the historic walls over the roofs of Ragusa or Dubrovnik, Croatia. 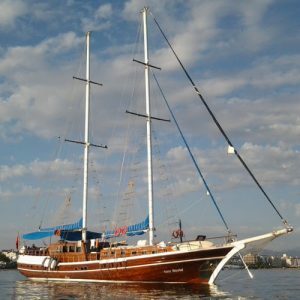 We can offer private guided gulet charters in Italy, Croatia, Greece and Turkey, and expert-led land tours in all those countries plus Ireland and the United Kingdom. We can concentrate on famous highlights, great cities and lively ports, or we can seek the calmer pleasures of lonely coves or idyllic rural retreats. In every case, we design the itinerary with your wishes and interests in mind, creating a tailor-made bespoke tour or cruise just for you. For an introduction to our charters see here, for bespoke land tours, please contact us directly. Well, if you have been reading this all the way down here, you might indeed be interested in our tours and cruises. If so, the next step might be to browse, download or request our brochure for more information, to peruse our website – and to follow us on Facebook. As I mentioned above, some of our 2019 trips are already close to selling out, so if anything here really tickles your interests, don’t let it wait too long. Of course, all the tours listed here, and perhaps some more, will also be available in 2020, Most importantly, if you have any questions, feel free to contact us. We’d love to see you in 2019!